The top five teams from the 2015 World Synchronized Skating Championships made history in December when they competed their free programs at the 2015 Grand Prix Final in Barcelona, Spain. The invitation to compete on the same ice as the top figure skaters in the world marked a major milestone for the sport. 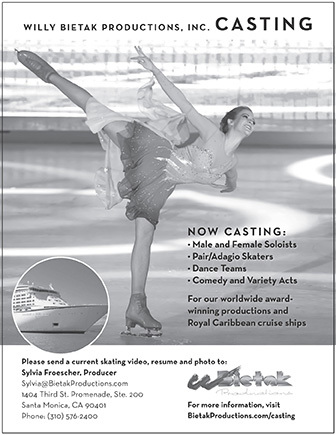 It was the first time that synchronized skating had been included on any figure skating competitive roster. Prize money totaling US$17,500 was awarded for the first time to all five teams. This amount was proportioned by placement, with the winning team receiving $5,000. Many of the figure skating fans that remained in the arena to watch this event had never seen a top-ranked synchronized skating competition before. But they had no hesitation in showing their appreciation for the discipline, joining the synchro fans in attendance in cheering and applauding for every team. Russia’s Team Paradise, the 2015 World bronze medalists, claimed the gold medal with a score of 131.09. It was only the second time the nation had won a medal at a top-level international event and both were won within the space of nine months. The team, performing to music from “Carmen,” earned Level 4s for the pair element, group lift, pivoting line element and wheel. “We feel great about our performance. We had so much fun out there, and we per- formed like we do in training,” said Team Captain Anna Iurchenko. Finland’s Team Rockettes, fourth at the 2015 World Championships, scored 127.66 to capture the silver. Their performance to “Galactic Invasion” and “A Day in the Life” was highlighted by three Level 4 elements. Well-executed death spirals highlighted Sweden’s Team Surprise fast-paced performance to Khachaturian’s “Sabre Dance.” Mistakes on the twizzles and two falls proved costly, and the team placed fourth with 118.48 points. America’s Team Haydenettes had a rough outing, with three falls marring the program set to music from “So Much to Prove” and “Street Dance 2.” The team ranked fifth with 106.81 points.